St. Paul, Minn., November 13, 2018 – PolyMet Mining Corp (“PolyMet” or the “company”) TSX: POM; NYSE American: PLM – today reported that it has filed its financial results for the three and nine months ended September 30, 2018. PolyMet received its Permit to Mine on November 1, 2018 and controls 100 percent of the development-stage NorthMet copper-nickel-precious metals ore body and the nearby Erie Plant, located near Hoyt Lakes in the established mining district of the Mesabi Iron Range in northeastern Minnesota. Execution of a construction finance plan. Note: Working capital deficit is due to the Glencore debentures being classified as current on the basis they mature on or before March 31, 2019. At September 30, 2018, PolyMet had cash of $6.962 million compared with $6.931 million at December 31, 2017. Subsequent to quarter end, an additional $25 million was received from Glencore under the March 2018 agreement described above. As of September 30, 2018, PolyMet had spent $131.315 million on environmental review and permitting since the NorthMet Project moved from exploration to development stage. Loss for the three months ended September 30, 2018, was $1.688 million compared with $2.251 million for the prior year period primarily due to non-cash items. 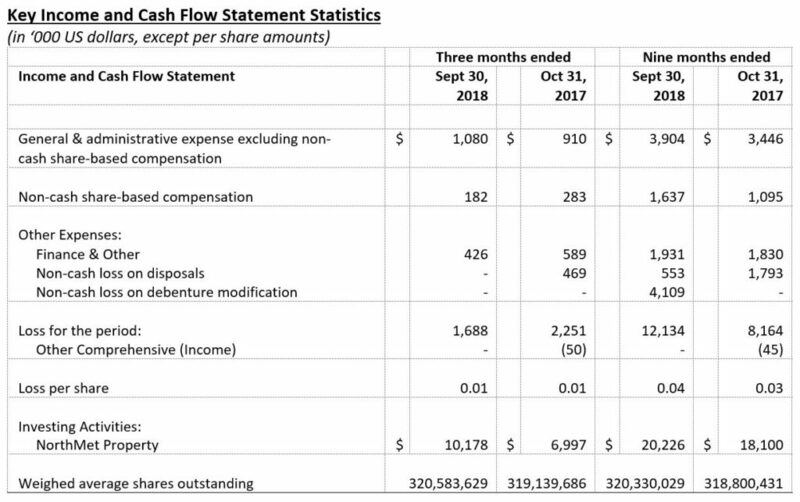 General and administrative expenses for the three months ended September 30, 2018, excluding non-cash share-based compensation, were $1.080 million compared with $0.910 million for the prior year period. Other expenses were $0.426 million compared with $1.058 million for the prior year period primarily due to non-cash items. Loss for the nine months ended September 30, 2018, was $12.134 million compared with $8.164 million for the prior year period primarily due to non-cash items. General and administrative expenses for the nine months ended September 30, 2018, excluding non-cash share-based compensation, were $3.904 million compared with $3.446 million for the prior year period. Other expenses were $6.593 million compared with $3.623 million for the prior year period primarily due to non-cash items. PolyMet invested $10.178 million cash into its NorthMet Project during the three months ended September 30, 2018, compared with $6.997 million in the prior year period primarily due to wetland credit purchases. For the nine months ended September 30, 2018, PolyMet invested $20.226 million cash into its NorthMet Project, compared with $18.100 million during the prior year period.